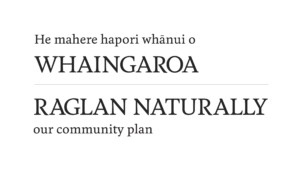 For us in Whaingaroa, wellbeing is about the health of our whole person – mind, body and spirit – in connection with our whole community and our environment, and with the Treaty of Waitangi as an overarching guide. The Hauora is a Māori philosophy of health and well-being unique to New Zealand. There are four dimensions of Hauora; Taha Tinana (Physical Wellbeing – health), Taha Hinengaro (Mental & Emotional wellbeing – self-confidence), Taha Whanau (Social Wellbeing – self-esteem) and Taha Wairua (Spiritual wellbeing – personal beliefs) There is physical, emotional/mental, social and spiritual caring. Raglan is a vibrant, caring community that engages in issues important to us. We are resilient and open to growth and change, with a strong community spirit that keeps us connected and cohesive. There is strong local leadership in all age groups and we live in an environment rich in natural resources that support wellbeing. General Practitioners and practice nurses at clinic in town. West Coast Health are going to be building a purpose built medical centre. PRIME (Primary response in medical emergencies) during West Coast Health opening hours. St John’s NZ are currently reviewing PRIME. Isolation and loneliness, particularly in our older community members but also with youth and young families. Health literacy the capacity to find, interpret and use information and health services to make effective decisions for health and wellbeing. How does Community Wellbeing impact this challenge? What is the opportunity for us in Community Wellbeing in relation to this challenge? Opportunity: to create sustainable, human values in our community, working and flourishing together, local sustainable manufacture, making goods that last and can be repaired, better mental and physical health. A central Wellbeing hub that connects our people with available community services. This is easily accessible with parking nearby, and includes a central meeting area with a kitchen/café type space and storage space for the community groups that meet there. ‘We invest in community connectedness’ A dedicated Community connector, based in the Wellbeing Hub, who can actively broker relationships and connections for people who are isolated and lonely, or who need community support. Safety Raglan is a safe and an age friendly community – all stages of life, and their transitions, are acknowledged, valued and looked after. Healthcare is holistic and affordable. We look after our physical, mental, spiritual and emotional wellbeing and every member of our community can access support for this through conventional and complementary health therapists, including after hours and weekends. · An up-to-date Directory of services and community organisations available to all. We acknowledge that looking after our Mother earth, our environment, is part of looking after ourselves and we take pride in caring for our town and its environs. Cooperation We are curious about and respectful of the diverse cultures within our community, and we celebrate our own. Community Bus operating around the Raglan area. Community We have access to efficient and reliable communication tools and technology. Raglan has a sustainable economic base. 2. In terms of Community Wellbeing in Raglan in 2018, what do you see as our current most important strengths or assets? 3. What do you consider our biggest or most important challenges? 4. Looking to the future, what aspirations do you have for community wellbeing in Raglan in the short and long term?